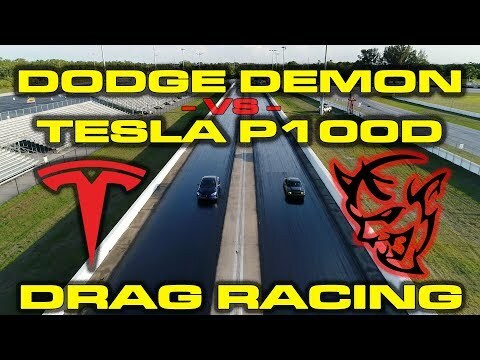 The Dodge Demon is an incredible machine that will tear up the drag strip. With over 800 horsepower and the ability to run on race gas, it is a street legal monster. Only a few road cars can hold their own against the Demon in a straight line. These include the supercars like the Porsche 911 GT3, McLaren 720S and Ferrari 488 GTB. The Tesla Model S also has a history of running fast times on the strip. The Dodge Challenger SRT Demon made its debut in New York in a press even during the New York Auto Show. We’ve had what seems like months of anticipation, but finally have the real numbers. The car’s name says about all you need to know as this new Dodge is so scary, it is straight from Hell. The Demon is the car for people that look at the Challenger SRT Hellcat and say, 707 horsepower just isn’t enough. In a straight line it is hard to find a faster production car. We just need one second for us to pick our jaw up and then we can share the specification highlights. Is This What The New Dodge Challenger SRT Demon Will Look Like? The new Dodge Challenger SRT Demon is much anticipated and will make its official debut at the New York Auto Show. Before the muscle car is unveiled Dodge has released teasers of the car thought to be more powerful than the 707 horsepower Hellcat. The Dodge Demon is a legendary name. It was originally attached to the Dart and then a concept car from 2007. The name is one of fear and evil. If all we have heard is true then both drivers and rival muscle cars should approach it with a healthy dose of respect. Now for 2018 Dodge is giving the Demon name to the Challenger. Full details won’t be known until April when the high performance Challenger SRT Demon makes its debut in New York. However, they have let us know a bit of information and of course there is plenty of speculation to go with it.